enforcement of resource protection regulations. These efforts help in the recovery of the least tern and snowy plover while keeping OHV use and other recreational opportunities available to the public. 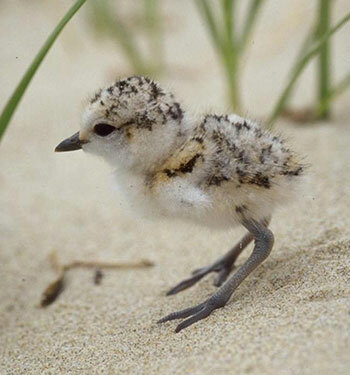 The number of breeding snowy plover adults at Oceano Dunes has steadily increased over the years. In 2002, the minimum breeding number of adults was 32. With increased management the number of breeding adults jumped to 84 in 2003 and the average for the 14-year period 2004-17 was 150 (range=79-226). The average has continued to increase to 197 minimum adults for the 5-year period 2013-17 (range=163-226) and 199 minimum adults for the 3-year period 2015-17 (range=183-209). For the 16-year period 2002-17, there were an average of 161 nests (range=35-281), the average hatch rate was 75%, and the average chick fledgling rate was 39%. For the 5-year period 2013-17, breeding results have improved to an average of 232 nests (range=178-281), a 78% average hatch rate (range=63-86%), and a 44% fledge rate (range=34-55%). One chick fledged per breeding male is the estimated number needed to prevent the population from declining and 1.2 chicks fledgling per male will allow for moderate population growth (US Fish & Wildlife Service 2007). For the 16-year period 2002-17, average productivity was 1.49 chicks fledged per breeding male. This average has also improved in recent years to 1.88 and 1.92 chicks fledged per male for the 5-year period 2013-17 and for the 3-year period 2015-17, respectively (California Department of Parks and Recreation 2016). 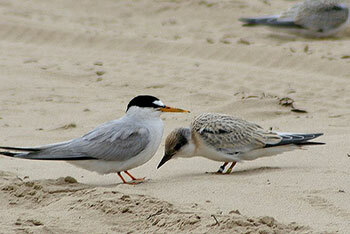 From 1991 to 1996, Oceano Dunes had a very small least tern colony of 0-5 breeding pairs. From 1997 to 2002, with management efforts, the number of breeding pairs in the colony slowly increased to an average of 19-21 (range=4-37). Continued efforts resulted in an average of 42-48 (range=23-66) breeding pairs at the Park for the 15-year period from 2003-17. During the same 15-year period from 2003-17, the average nest hatching rate was 82%. From 2006-17 the average chick fledging rate was 73% (580 fledglings produced), and the average fledglings per pair was 1.12-1.19. For all least tern colonies in California, the average number of fledglings per pair was 0.35-0.50 for 2016 (Frost 2017). Although the colony is small, Oceano Dunes has been one of the top contributors to the number of juveniles produced each year in California. For the safety of others around you and wildlife obey the posted 15 MPH speed limit and avoid driving through flocks of birds. California Department of Parks and Recreation, 2017. Nesting of the California least tern and western snowy plover at the Oceano Dunes State Vehicular Recreation Area, San Luis Obispo County, California 2017 Season. Unpublished Report, CDPR, Off-Highway Motor Vehicular Recreation Division. Frost, N. 2017. California least tern breeding survey, 2016 season. California Department of Fish and Wildlife, Wildlife Branch, Nongame Wildlife Program Report, 2017-03. Sacramento, CA. 20 pp + Appendices. Remember, Wildlife Has the Right of Way! You may not always see wildlife where you recreate, but at Oceano Dunes SVRA there is an abundance of wildlife, especially shorebirds. 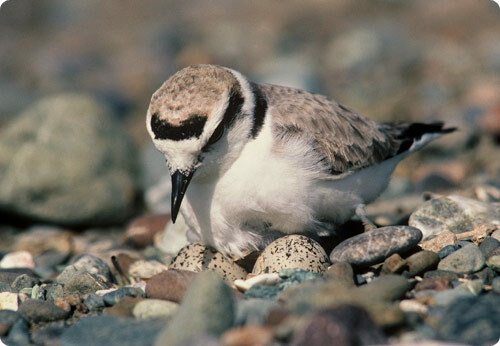 Two of them, the threatened Western snowy plover and the endangered California least tern, are protected by the federal Endangered Species Act. March 1 – September 30 these birds are nesting on the sands of Oceano Dunes SVRA. Winter months the plovers are most vulnerable because they are typically inactive. They often crouch in small depressions in the sand, which make them very well camouflaged and extremely hard to see. Year round, shorebirds are easily disturbed by people and dogs. Please keep your distance. How do I protect my recreational opportunities? Obey the posted 15 mph speed limit. Dogs must be kept on leashes at all times. Do not drive into flocks of birds. Give all birds the right of way. Dispose of trash properly. Trash attracts predators. Do not enter posted nesting areas. Parking/camping is prohibited within 100 feet of posted nesting areas. No kite flying south of Pier Avenue March 1-September 30 (Nesting Season). Kites look like predators. Please report to park staff any nests, threats or disturbances to plovers.